Having been born and bred in Newcastle, I still like to call myself a Geordie (even if the accent has faded a bit!) After school, I studied for five years at Glasgow Vet School, graduating in 1983. Fairly soon afterwards I moved to Kent and have spent all my working life in the county. For the first twenty-five years, I was in mixed practice looking after farm animals and horses as well as smaller pets, but five years ago, I decided to concentrate solely on domestic animals. 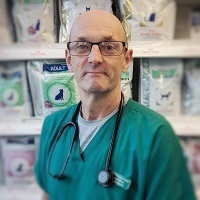 As a veterinary surgeon in general practice no two days are ever the same; I enjoy the challenge of dealing with the endless variety of clients and animals that come through the door with all their diverse range of ailments. I also enjoy being able to work through surgical cases from start to finish and have a particular interest in orthopaedics. I am married to Jo and we have three daughters, two of whom at least hope to pursue medical careers. Animals have always been part of our lives and we currently have a black Labrador, a ginger cat, a pony and Doris, the chicken. Outside work, sport has always been my way of relaxing; as I grew older and my body started to complain, rugby and squash were replaced with running and later triathlon. Sadly, injury forced me to give up but luckily my children seem to have inherited my love of sport and I now derive great pleasure watching my daughters from the touchline.